Travel I-95 North and exit at Columbus Blvd.\Washington Ave Exit (#20). At the bottom of the exit ramp, turn left onto Columbus Blvd. Proceed past signs for 676 and 76. Get in left lane. Turn left at traffic light at Dock Street. Turn right on Front Street (the next street) and left onto Walnut Street. Proceed eleven blocks to theatre. Take the Schuykill Expressway (Route 76) East to 676 East (Central Philadelphia) to 8th Street Exit. At the bottom of the ramp, make a right onto 8th Street. Continue several blocks to Walnut Street and make a right onto Walnut Street. The Forrest is on Walnut Street between 11th and 12th Streets. Take I-95 South to Exit 22 (Central Philadelphia/ 676 East). Go straight and continue straight through 6 traffic lights to Walnut Street. Make a right onto Walnut Street. 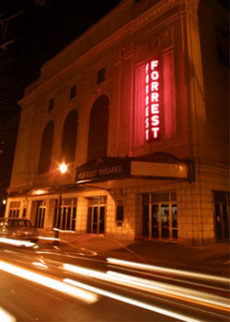 Forrest is on Walnut Street between 11th and 12th Streets. Stay in the left lane while coming over the bridge. Exit on 8th Street (south). Continue on 8th Street several blocks until you reach Walnut Street. Turn right on Walnut Street and travel for 3 blocks. The theatre is on Walnut Street between 11th and 12th Streets. Turn right off Turnpike to 73 North (Camden/Philadelphia), travel for a few miles. Take 38 West (Ben Franklin Bridge) for approx. 5 miles. Bear right at 38/30 intersection, follow signs to Ben Franklin Bridge. After toll, get into LEFT lane and cross bridge. You are now on 676 West (Vine Street Expressway). Exit at the 8th Street (Chinatown) exit. Travel 8th Street south several blocks to Walnut Street. Turn right on Walnut Street. Theatre is on Walnut Street between 11th and 12th Streets (3 blocks). Take the PATCO High Speed line and exit at 12th Street. Walk north one block to Walnut Street. Take the Market Frankford subway and exit at 11th Street. Walk three blocks south to Walnut Street. Bus Routes 42, 21, 12, 76 and the "Phlash" Visitor Bus all stop within three blocks of the theatre. Take the Broad Street subway and exit at the Walnut/Locust Station. Walk east 2 ½ blocks. From any SEPTA Regional Rail line, exit at the Market East Station and walk through the Convention Center to Market Street. Walk three blocks south to Walnut Street.